Wisconsin Territorial Capitol (first in Madison) viewed from State Street. The back wall of the east wing of the replacement capitol (second on the site) can be seen behind the Territorial Capitol. A smaller building, possibly a construction shack, is to the left. In 1837, when construction of the second Capitol began, the Capitol was oriented toward King Street, then Madison's commercial center. 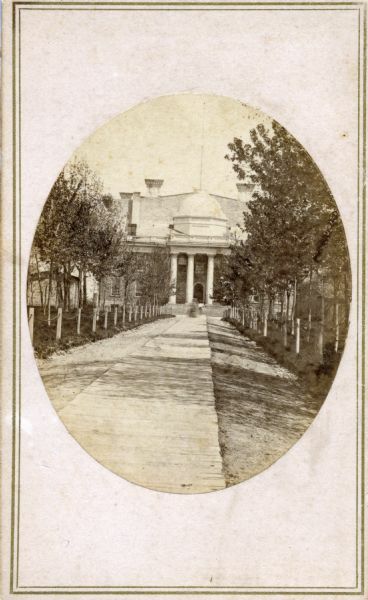 Thus, this photograph, which was taken from State Street, actually documents the Capitol's "back door." The Third Capitol was built by constructing its four wings around the old building and then destroying the old Capitol so that the central rotunda could be built on its foundations. This phased construction was necessary to maintain the fiction that the new building was an "expansion" and not a new building. Construction of an entirely new capitol, it was thought, might raise the issue of moving the capital from Madison to Milwaukee. This photograph, which was taken between January of 1859 and the summer of 1861, also gives an early view of the Capitol Park and walkways. See Image ID: 66682 for stereo view loaned by Jeff Hinds.